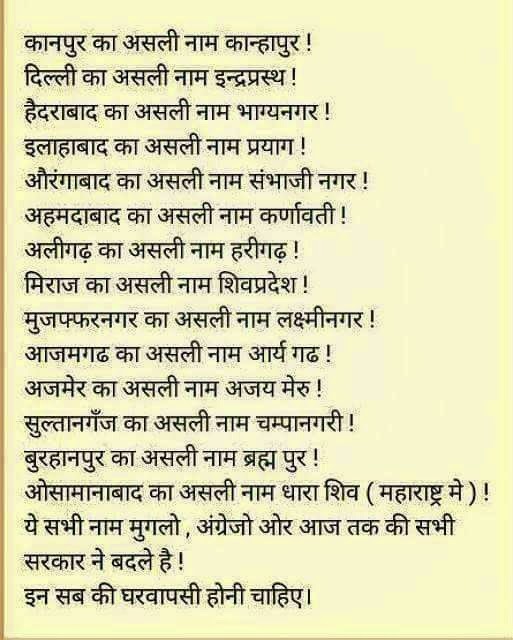 Facebook - Tapan Ghosh - RSS Attempting To Explain Ideology to Muslims - Some Questions. On March 18 2015, newly appointed Prant Karyavah (State Secretary) of South Bengal Sri Jishnu Basu addressed a press conference at RSS office at Kolkata. Not many paper/media covered it. 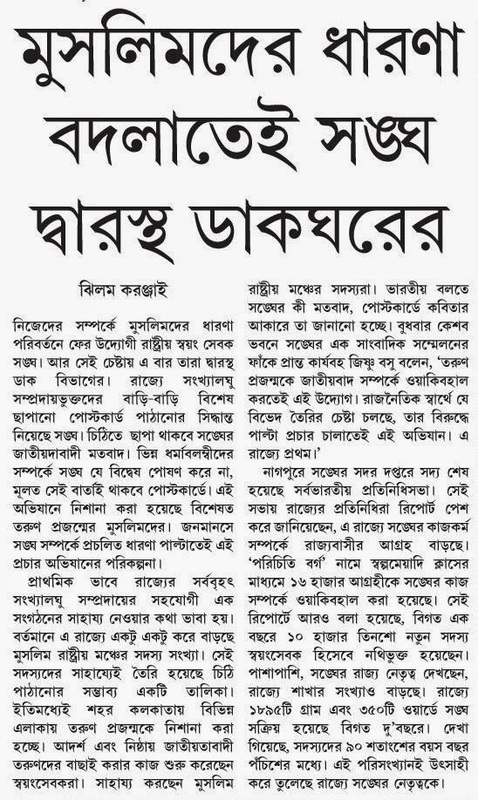 But "Ei Samay", the Bengali newspaper of TOI group, published a 2 column report today. According to this report, RSS going to start a Post-Card campaign targeting Muslim youths, to change it's image among them. By printed message on these postcards, RSS will make a serious effort to convince the Muslim youths that RSS is not anti Muslim and not against any other religions. I FAIL TO UNDERSTAND WHAT RSS ACTUALLY WANTS TO ACHIEVE BY THIS! (1) Is it not an appeasement policy? (2) Should it be a priority for RSS in a border state like West Bengal with 30% Muslim population? (3) Will it help the persecuted Hindus in Muslim dominated areas of rural Bengal to get rid of many types of tortures inflicted upon them by the fanatic Muslims? 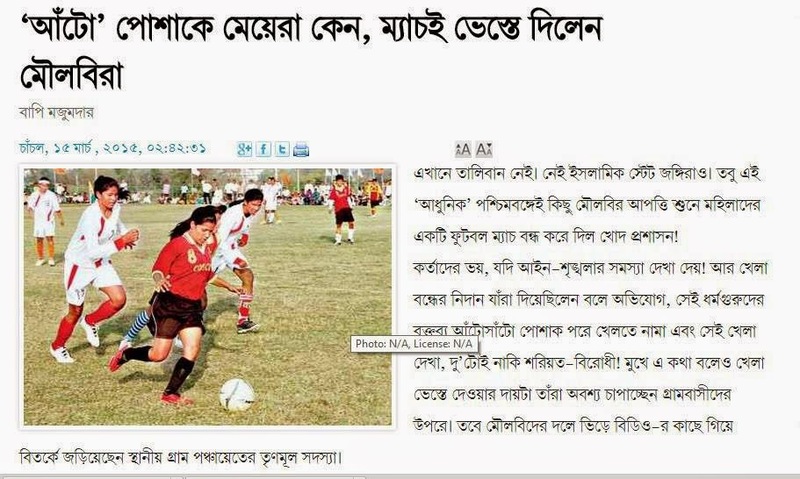 In the village of Chandipur under Harishchandrapur block in Malda district, yesterday local administration stopped Women's Football match obeying the Fatwa of local Maulavis. The Maul...avis ordered to stop the match because according to Sharia (1) women are not allowed to wear tight dress & (2) people are not allowed to see the women in tight dress. Plz note the names of the village & the block. Both the devout Hindu names are testimony that this area was once predominantly Hindu area. Now it is Muslim majority area. Not only that, Sharia and Maulavis' words are rule here. 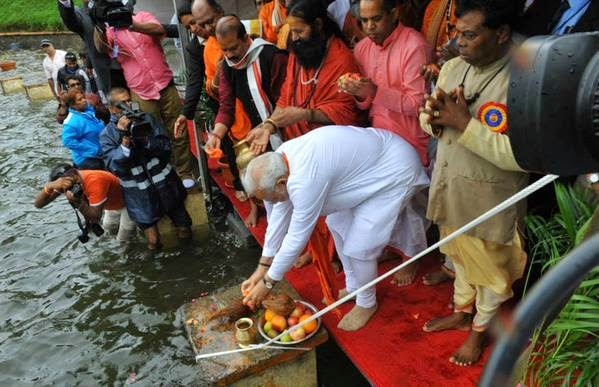 Thank you Modiji for your courage of conviction in Hindutva ideology. Bengaluru Police arrested 1 person for his questioning the basic tenets of Christianity. Facebook - Tapan Ghosh - Need of the hour is another Ghar Wapsi. Advani was HM when in 2002 we released Geelani,Yasin Malik,Shabir Shah. Twitter - Tapan Ghosh - Will Bengal BJP React On This ? This report clearly shows dat Muslims Will not be satisfied unless they get another chunk of West Bengal as Islamic land. Compiled by Hindu Samhati President Tapan Ghosh. We are getting reports from West Bengal village that little Hindu girls are pressurized to take admission in Madrasa. Nothing in the world can be owned free of cost, so is peace. When you cannot own a petty pencil without paying for it, how can you expect to have peace free of cost? Our forefathers failed to pay the price of peace in East Bengal and as a result, became refugee. Do you still prefer to follow the same path they chose? You and your, so called secularism are taking West Bengal towards another Islamic land. West Bengal will not survive for long. Who is going to save a race, which has not learned any lesson from the partition of 1947? The history books tell that Sher Shah ascended the throne of Delhi on May 17, 1540, by defeating Humayun in a battle near Kannauj and in the same year organised a military campaign to suppress the revolt of the Gakkars in Punjab . He moved east, the next year, to suppress a similar revolt in Bengal in March, 1541 AD. The next year, he moved against the Rajput kings in central India and conquered Malwa. The very next year (...i.e. in 1543 AD), he organised a campaign against the Hindu king Puran Mal and took control of the fort at Raisin and then moved against the Rajput king of Marwar. In 1544 he subdued the Rathore king, Maldev and in the subsequent year, he died in an accident in 1545 AD, in Kalinjar. Exposing the myth of Sher Shah's constructing G. T. Road from Dhaka to Multan, a stretch of 4800 km. In this case our historians' sycophancy of Muslim rulers crossed all limits. The history books tell that Sher Shah ascended the throne of Delhi on May 17, 1540, by defeating Humayun in a battle near Kannauj and in the same year organised a military campaign to suppress the revolt of the Gakkars in Punjab . He moved east, the next year, to suppress a similar revolt in Bengal in March, 1541 AD. The next year, he moved against the Rajput kings in central India and conquered Malwa. The very next year (i.e. in 1543 AD), he organised a campaign against the Hindu king Puran Mal and took control of the fort at Raisin and then moved against the Rajput king of Marwar. 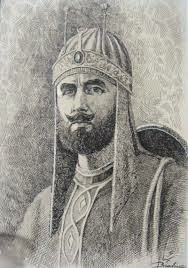 In 1544 he subdued the Rathore king, Maldev and in the subsequent year, he died in an accident in 1545 AD, in Kalinjar.